This is a fine example of the work of the Masters of Hugo Jansz. van Woerden, a group of Dutch illuminators active in Leiden around the years 1475-1500. Inaccurately named after the Leiden printer Hugo Jansz. van Woerden, whose books contain printed woodcuts that, in the past, have been associated with these same Masters, these Leiden illuminators made appealing, quite popular Books of Hours. The so-called Masters of Hugo Jansz. van Woerden, active during the final quarter of the 15th century, made attractive, relatively unpretentious, yet appealing Books of Hours. In the past, similarities between the miniatures of these painters and the woodcuts found in the Leiden printer Hugo Jansz. van Woerden's books gave reason to suggest that the illuminators, too, were responsible for the woodcuts. Although this theory has been abandoned, the illuminators are still indicated by the name of the printer. Generally, the miniatures by these Masters are painted in gouache, more often in thinly applied colours. The washed pen-drawings are made in a soft, painterly style. In their mixed media miniatures, the artists were able to link the spontaneity of drawings with the colourfulness of painted miniatures. The illuminators are known for their somewhat bold, simplified compositions with angular, elongated figures. Perhaps this was borrowed from or encouraged by their extensive knowledge of prints: woodcuts and engravings by Dutch as well as German artists, such as Martin Schongauer and Albrecht Dürer, or the blockbook Biblia Pauperum, possibly designed in the Netherlands in the 1460s. The six main texts in this book each open with a historiated initial. Facing five of these is a full-page miniature painted on a separate, single leaf, inserted into the book block. The Crucifixion miniature shows the patron and his wife. 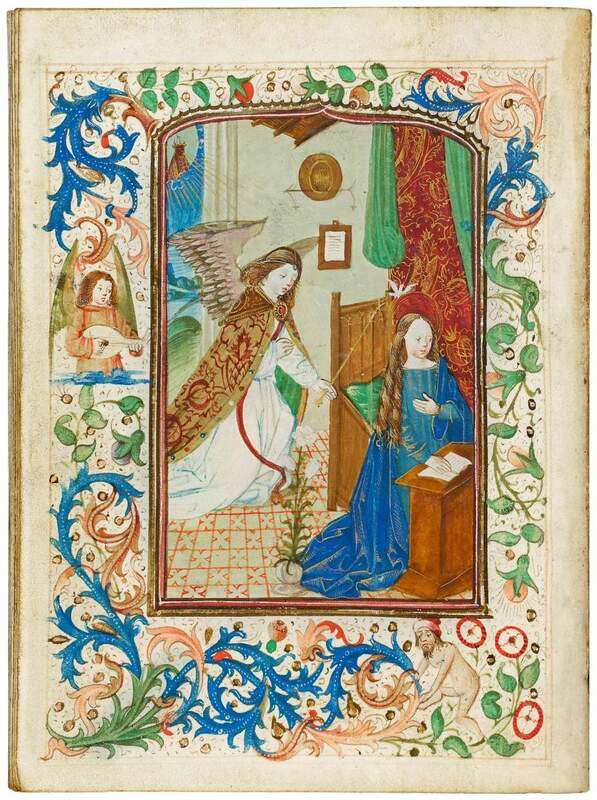 All miniatures are surrounded by full borders, the pages with an historiated initial have decoration over three borders, and all contain the so-called Leiden blue (elongated) acanthus leaves. In the historiated scenes, courtly figures often appear, such as a knight fighting a dragon, a damsel with a small dog, angels making music, praying, or carrying instruments of the Passion, playing figures, and several colourful birds. Manuscript production at Leiden has long since been linked to the monastery of Hieronymusdal at Lopsen, just outside the city walls. The Brothers of Hieronymusdal – a foundation (1404) under the influence of the Devotio Moderna – supported themselves by making illuminated manuscripts and even panel paintings. The monastery housed a workshop of panel painters with 3 or more assistants each year. We also know from their archives that they collaborated with painters in Leiden itself, some of whom lived, literally, ‘next door’. However, the pictores known by name died before 1482. The Lopsen archives also speak of their own illuminatores and imagines, but all remain anonymous. Whereas in the painters’ workshop, the Friars collaborated with laics, the writing was entrusted to only the Brothers of the House (in 1445 at least 14 Brothers were involved, among whom were five priests). By 1526, the demand for printed books had long surpassed that of handwritten books and Hieronymusdal had to close its doors, as the brothers no longer could support themselves by copying books. Lopsen at Leiden is the only known religious house that went bankrupt because it could not compete with the art of book printing. After the monastery was abandoned in 1526, it became de facto a poverty relief institution. While all this underlines the frailty of men and business, the Leiden manuscripts, finely produced books, have survived the ages and continue to charm. Moreover, Leiden's good reputation for art continued with painters from Cornelis Enghbrechtsz (1462-1517), Lucas van Leyden (1494-1533), to Jan Lievens (1607-1674), and Rembrandt van Rijn (1606-1669).